How does increasing the cost to one party magically inject wealth into the economy? For now, we will ignore the detrimental effects of pricing low-skill workers out of employment, as that effect has been discussed ad nauseam. Let’s also ignore what is “right” or “fair” to either the owner and the worker. Let’s solely evaluate the claim from the perspective of growing the economy, a goal that we agree with. So let’s say there’s a company with 1000 workers, maybe a chain of fast food restaurants. It is projected to make $1m a year in profits after expenses at the existing wages. Let’s review the effects on the overall economy of 2 pathways. A, the owner is forced by the government to pay the 1000 workers an extra $1000 each ($0.50 per hour raise), or B, the owner is allowed to keep the profits for himself. A: An extra $1000 in each worker’s pockets could buy lots of stuff! 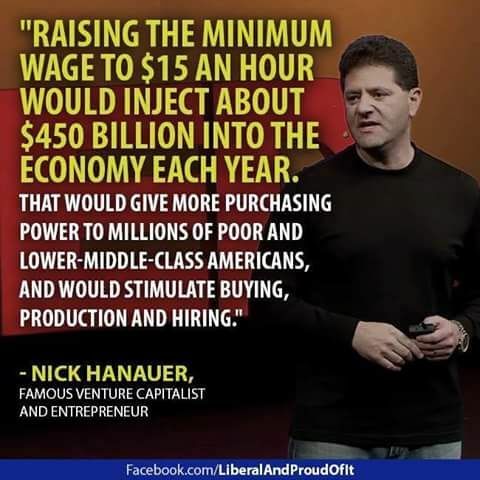 Their ability to purchase addition goods and services will increase demand, and the supplier of those goods and services will make more money and/or hire more workers, increasing employment, and perpetuating the cycle of increased demand. This must surely be good! B: The belief that extra wages would be injecting wealth into the economy is ignoring the fact that the employer is himself a consumer. Unless he is a pointless hoarder, he will either spend or invest the $1m, the latter likely being how the employer got to where he is. A: The $1000 received by the workers may not be worth the full $1000 as received. In the short run, the increased demand puts shock on the supply of goods and services. If the 1000 people each seek to buy new apparels, the stock of clothing does not magically appear. Thus, stores can now either raise prices, or cancel promotions, as they no longer have to give discounts to clear their inventory. In the long run, suppliers of the goods and services can either just keep raising prices to capture the increased wages, or they can hire more workers to increase production. B: The business owner most likely will not personally consume all $1m of the profits. He might increase his spending somewhat, stimulating the economy and increasing employment the same was as his workers would with more wealth. However, the owner also has funds available to invest in expanding his new business, say open another franchise. His investment will create about 10 construction job-years, plus the purchase of materials and equipment that creates another 10 manufacturing job-years. Upon completion, the new restaurant will provide long term jobs. While the workers’ aggregate consumption may indirectly create jobs (while increasing prices), the owner’s investment directly creates jobs. A: Of course, it’s possible for the workers to collectively pool their resources and open a competing business, by contributing savings for a share of the business. Thus a corporation is born. Previous More Liberalism – More Prosperity?